The fishery sector is important from Indian economy view point as it contributes a source of income to a number of fishermen and has huge export potential. The systems and technology used in aquaculture has developed rapidly in the last fifty years. They vary from very simple facilities like family ponds for domestic consumption in tropical countries to high technology systems like intensive closed systems for export production. Much of the technology used in aquaculture is relatively simple, often based on small modifications that improve the growth and survival rates of the target species. Nowadays, the fish and fisheries industry is one of the fastest growing international commodity markets globally. Guaranteeing an adequate supply to this international market requires hundreds of thousands of fishing vessels and fish farms, as well as tens of thousands of fish processing workers, wholesalers and retailers in countries spread all over the world. The fishery sector thus generates employment and income for millions of people and in one of the major fields to venture. A wide range of aspects of fresh water aquaculture such as selection of species of fish and shellfish, construction and preparation of various types of fish ponds, control of aquatic weeds and predators, production of seed fish and their transportation, fish nutrition and fish diseases and their control pertaining to composite fish culture, air breathing fish culture etc. have been dealt with a length for easy adoption. The major contents of the book are classification of fishes, general characters of fishes, techniques in fish identification, cold water fisheries of India, physical and chemical properties of fishery water, chemical constituents of fish, economic importance of fishes, fish in relation to human health, construction of fish farms, etc. In this book you can find all the basic information required on the fundamental aspects of the fisheries and aquaculture technology with detailed information of their applications a wide variety of industrial processes etc. The book is very useful for research scholars, technocrats, institutional libraries and entrepreneurs who want to enter into the field of aquaculture technology. Class Chondrichthycs (Sharks, Rays, Skates, and Chimaeras). Skinning Dogfish and Tope etc. Characteristic features and distribution of M.
Alkalinity due to Calcium Carbonate : (SBV). The rising cost of protein-rich fish food and chemical fertilisers as well as the general concern for energy conservation have created an awareness in the utilisation of rice and other crop fields and livestock wastes for fish culture. Fish culture in combination with agriculture or livestock is a unique and lucrative venture and provides a higher farm income, makes available a cheap source of protein for the rural population, increases productivity on small land-holdings and increases the supply of feeds for the farm livestock. In this system, fish culture is integrated with agricultural crops such as rice, banana and coconut, thereby producing fish and agricultural crops under one interlinked system. Though rice-fish culture is an age-old practice in India, it is not given fillip owing to the use of insecticides in rice fields. In India, though six million hectares are under rice cultivation, only 0.03 per cent of this is now used for rice-fish culture. 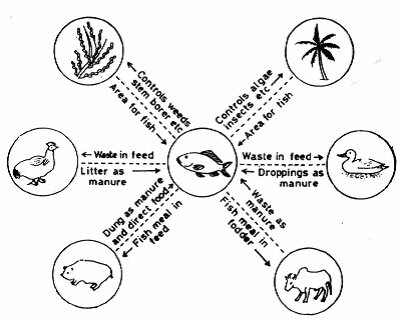 This type of fish culture has several advantages such as (a) economical utilisation of land, (b) little extra labour, (c) savings on labour cost towards weeding and supplemental feeding, (d) enhanced rice yield, and (e) additional income and diversified harvest such as fish and rice from water, and onion, bean, and sweet potato through cultivation on bunds. Considering these, it is imperative to expand fish culture in the rice fields of our country. For the culture of fish in combination with rice, varieties such as ADT 6, ADT 7, Rajarajan and Pattambi 15 and 16 are suitable. These varieties not only possess strong root systems but also are also capable of withstanding flooded conditions. Further, they have a life span of 180 dyas and fish culture is possible for about four to five months after their transplantation. Fish culture in rice fields may be attempted in two ways, viz. simultaneous culture and rotation culture. In the former, rice and fish are cultivated together and in the latter; fish and rice are cultivated alternately. Description of rice plots for fish culture: For simultaneous culture, rice fields of 0.1 ha area may be economical. Normally four rice plots of 250 m2 (25 x 10 m) each may be formed in such an area. In each plot, a ditch of 0.75 m width and 0.5 m depth is dug. The dikes enclosing the rice plots may be 0.3 m high and 0.3 m wide and are strengthened by embedding straw. The ditches have connections with the main supply or drain canal, on either side of which, the rice plots are located, through inlet-outlet structures of the dikes. The depth and width of the supply or drain canal may be slightly smaller than that of the ditches. Suitable bamboo pipes and screens are placed in the inlet and outlet structures to avoid the entry of predatory fish and the escape of fish under culture. The ditches serve not only as a refuge when the fish are not foraging among rice plants, but also serve as capture channels in which the fish collect when water level goes down. The water depth of the rice plot may vary from 5 to 25 cm depending on the type of rice and size and species of fish to be cultured. Culture procedure : Five days after transplanatation of rice, fish fry (1 cm) are stocked at the rate of 5,000/ha or fingerlings (8-10 cm) at the rate of 2,000/ha. The stocking density can, however, be doubled if supplemental feed is given daily, particularly if plankton is found depleted after 10 days of stocking fish. The plankton production in rice fields could, however, be increased if some amount of fertiliser more than what is required for rice fields is added. To control the menace of insects, the insecticide Furadon (Carbofuran) may be used at the rate of 1 kg/ha. The insecticide is mixed with basal fertilisers and applied once during the final harrowing. It may be stated that fish grown in insecticide-applied rice fields are safe for human consumption. After a period of 10 weeks (if stocked with fry) or six weeks (if stocked with fingerlings), the rice fields are slowly drained off and the fish are harvested. The harvesting of fish may be done about a week before the harvest of rice. The growth rate of fish is also moderate in rice fields as the production of plankton, the fish food organisms, is rich. Individual growth of 60 g and a per hectare yield of 500 kg have been reported under the simultaneous culture practice. Semi-intensive culture of Macrobrachium rosenbergii could be undertaken in rice fields. Unlike for fish-rice culture, bunds for fish-prawn culture are raised so as to enclose 12 cm of water for four months, the period of rice culture. Further, inlets and outlets should be provided with extended screen, say, 0.3 m above water surface to prevent climbing and escape of prawns. One or two small sump pits (1 x 2 x 0.5 m) should also be constructed near the outlet for trapping prawns when water is drained at the time of harvesting. The stocking of juvenile prawns (2-3 cm size) at the rate of 1,000/ha may be done after the rice seedlings are well rooted. No supplementary feeding of prawns is required in this system. Fish increases rice yield by 5 to 15 per cent, which is chiefly due to the indirect organic fertilisation through the fish excrement and also the control of unwanted filamentous algae which may otherwise compete for the nutrients. Tilapia and common carp control the unwanted aquatic weeds which may otherwise reduce the rice yield up to 50 per cent. Insect pests of rice like stem borers are controlled by fish feeding on them like murrels and catfish. Fish feed on the aquatic intermediate hosts such as malaria causing mosquito larvae, thereby controlling water-borne diseases of human beings. Rice fields may also serve as fish nurseries to grow fry into fingerlings. The fingerlings, if and when produced in large quantities may either be sold or stocked in production ponds for obtaining better fish yield under composite fish culture. Limitations in simultaneous culture: The simultaneous fish-rice culture may have some limitations, like (a) use of agrochemicals is often not feasible, (b) maintaining high water level may not be always possible, considering the size and growth of fish, (c) fish like grass carp may feed on rice seedlings, and (d) fish like common carp and tilapia may uproot the rice seedlings. However, these constraints may be overcome through judicious management. Through this practice, fish and rice are cultivated alternately. The rice field is converted into a temporary fishpond after the harvest. This practice is favoured over the simultaneous culture practice as it permits the use of insecticides and herbicides for rice production. Further, a greater water depth (up to 60 cm) could be maintained throughout the fish culture period. One or two weeks after rice harvest, the field is prepared for fish culture. C. carpio is found suitable for this practice. The stocking densities of fry (2-3 cm) or fingerlings (5-8 cm) for this pracitce could be 20,000/ha and 6,000/ha, respectively. The fry are harvested after 10 weeks, while the fingerlings after six weeks. The average growth of the individual fish under this system has been reported to be about 100 g and a fish yield of about 2,000 kg/ha is possible. Further, it has also been reported that fish yield could exceed the income from rice in the rotational culture. In Kerala, fish and prawn are cultured on rotational basis in Pokkali rice fields. These fields under the influence of Vembanad backwaters which are in turn controlled by tides. As these fields are flooded during southwest monsoon (June-Septemeber) rice is cultivated. Fish and prawns are cultured during other periods. Immediately after the harvest of rice, the fields are leased out for the culture of fish and prawns. The young of fish and prawns enter the fields from nearshore waters alongwith high tides. These young are cultured by suitable management until harvest in May. These fields are rich in plankton owing to the decaying of paddy stumps. A prawn yield of 500-1,200 kg/ha has been obtained from Pokkali fields. After the prawn harvest, the water is drained off. Subsequently, the saline nature of rice fields is nullified because of the monsoon rains and the fields are again made fit for rice culture. The fish yields of different countries adopting rice-fish culture are given in the following Table. When banana or coconut is cultivated in rows in wetlands, the ditches made between such rows act as supply or drainage canals. These canals serve as fish culture systems owing to their round-the-clock supply of water and rich insect populations. Larvivorous air-breathing fish species such as snakeheads C. marulius and C. striatus and tilapia, O. mossambicus are ideal species for culturing in this system. In this practice, excreta of ducks, chicks, pigs and cattle are either recycled for use by fish or serve as direct food for fish. Hence, the expenditure towards chemical fertilisers and supplementary feeds for fish culture is not only curtailed to the barest minimum but also there is economy of space. Integration of fish culture and livestock farming is in vogue in many countries and the income realised has been found to be more than that of exclusive fish farming in ponds. It is highly profitable as it greatly enhances the animal protein production in terms of fish and duck per unit area. Ducks are known as living manuring machines. The duck dropping contain 25 per cent organic and 20 per cent inorganic substances with a number of elements such as carbon, phosphorus, potassium, nitrogen, calcium, etc. Hence, it forms a very good source of fertiliser in fish ponds for the production of fish food organisms. Besides manuring, ducks eradicate the unwanted insects, snails and their larvae which may be the vectors of fish pathogenic organisms and water-borne disease-causing organisms infecting human beings. Further, ducks also help in releasing nutrients from the soil of ponds, particularly when they agitate the shore areas of the pond. For duck-fish culture, ducks may be periodically allowed to range freely, or may be put in screened resting places above the water. Floating pens or sheds made of bamboo splits may also be suspended in the pond to allow uniform manuring. The ducks may be stocked in these sheds at the rate of 15 to 20/m2. It is better if the ducks are left in ponds only until they reach marketable size. Depending on the growth rate of ducks, they may be replaced once in two to three months. About 15-20 days old ducklings are generally selected. The number of ducks may be between 100 and 3,000/ha depending on the duration of fish culture and the manure requirements. For culturing fish with ducks, it is advisable to release fish fingerlings of more than 10 cm size, otherwise the ducks may feed on the fingerlings. The stocking density of fingerlings also depends on the size of pond and number of ducks released in it. As the nitrogen-rich duck manure enhances both phyto- and zooplankton production, phytoplankton-feeding silver carp and zooplankton-feeding catla and common carp are ideal for duck-fish culture. Under a stocking density of 20,000/ha and culture period of 90 days, a fish production of 2,000 kg/ha has been obtained in duck-fish culture. The droppings of chicks rich in nitrogen and phosphorus would fertilise fishponds. 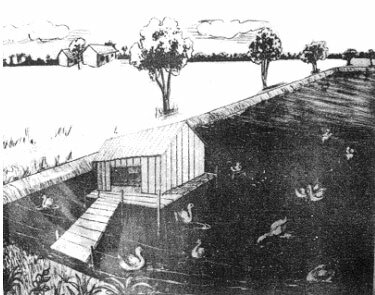 Poultry housing, when constructed above the water level using bamboo poles would fertilise fishponds directly. It is reported that by stocking 5,000 giant fresh-water prawn, Macrobrachium rosenbergii and 1,500 silver carp in one-hectare area, one can harvest 600 kg of prawns and an equal amount of fish in a four-month culture period. The number of chicks used for this system is about 250/ha. However, the stocking density of chicks may be increased in the event of increase in the stocking density of fish fingerlings. It is reported that a fish production of 10 t/ha could be obtained by culturing tilapia, common carp and murrels with a stocking density of 20,000 fingerlings/ha and chick density of 4,000/ha. No chemical fertilisers or supplemental feeds have to be given at any stage. As chick droppings form a direct food source for pigs, the chicks may be integrated with pigs in a two-tier system, which finally fertilise the fishpond. Depending on the size of the fishponds and their manure requirements, such a system can either be built on the bund dividing two fishponds or on the dry-side of the bund. As shown in the figure, the upper panel is occupied by chicks and the lower panel by pigs. Pigsties, however, may also be constructed in a nearby place where the urine and dung of pigs are first allowed to the oxidation tanks (digestion chambers) of biogas plants for the production of methane for household use. The liquid manure (slurry) is then discharged into the fishponds through small ditches running through pond bunds. Alternately, the pig manure may be heaped in localised places of fishponds or may be applied in fishponds by dissolving in water. Pigdung contains more than 70 per cent digestible feed for fish. It is reported that the feed while passing through the alimentary canal of pig, gets mixed with cetain enzymes which continue to act even after defecation. The undigested solids present in the pigdung also serve as direct food source to tilapia and common carp. A density of 60-100 pigs has been found to be enough to fertilise a fish pond of one hectare area. The optimum dose of pig manure per hectare has been estimated as five tonnes for a culture period of one year. Such a quantity may be obtained from 50 well-fed pigs. If the manure is to be applied in a dry form, a dosage of 400 kg/ha/day for 12 times in a year will be required. Fish like grass carp, silver carp and common carp (1:2:1) are suitable for integration with pigs. As in the case of chick-fish culture, there is no application of supplemental feeds and fertilisers. It is reported that a fish production of 3,000 kg/ha could be achieved under a stocking density of 5,000 fish fingerlings/ha in a culture period of six months. In India, through pigfish culture, the fish yield was doubled compared to that of polyculture with intensive feeding. Similar to pigsties, cowsheds may also be constructed in the vicinity of fishponds and the slurry from the biogas plants may be discharged into fishponds as in the case of pigfish culture. Countries like Hong Kong, Taiwan and Philippines have undertaken the integrated fish farming on a commercial scale and obtained considerable fish yields.